The unique nature of Finland during all the seasons offers you unforgettable opportunities to enjoy your holidays at our cottage. The farness from the noise of the big cities and the absence of the bustle of the big hotels with the combination of nice accomodation conditions will give you the possibility for an extraordinary and marvellous trip. The cottage is located at a very peaceful location nearly the popular skiing center Pyhatunturi. Nice location near two rivers, Kemijoki - the biggest river in Finland and Pyhajoki - cute river with gently sloping banks with secluded places gives you unforgettable moments enjoying of fishing all the year. 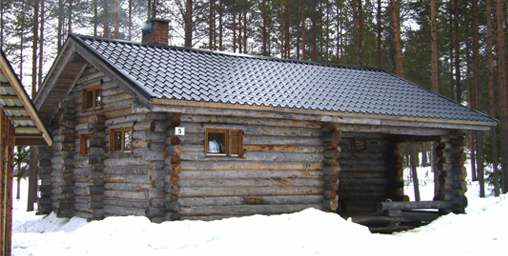 The cottage "Keloviitonen" is equipped with a rowing boat and basic fishing equipment. Starting from November, until the late March, you might enjoy of the Northern Lights (Sininen Hetki) from the cottage terrace after an active day at the slopes or a peaceful trip round the ski track nearby the cottage. Summertime with it's famous quiet white nights will bring you to the atmosphere of the harmony with the nature by barbiqueing at the cottage yard or to smoke the fish catched by yourself. Autumn time is the most attractive in the East Lapland. It is the time of "Ruska" - bright autumn dress of the forests and hills. For your comfort, while necessary, you will be guided by our local representative.